Killer's Trail of Thread: Some Alamo Heroes Fought Twice for Texas. It was May of 1835 in the Green Dewitt colony located in the Mexican province of Texas-Coahuila. Along the banks of the Guadalupe River, about fifty miles east of old San Antonio de Bexar, spring was manifest on every bush and tree. It was a countryside unmarred by either the axe or the plow, for the "advance of civilization" such as a cabin or wagon trail was rarely seen except near the village of Gonzales. Along the lonely trail from Gonzales to San Antonio, there lived only one settler. John Castleman had brought his young family there to the valley of the Guadalupe sometime before 1825. He built a strong log cabin there, complete with shutters that locked securely from the inside, and for defense against Indians he surrounded his home with a palisade of sharp cedar posts. Nearby was a small lake and a shallow wagon ford across the Guadalupe, and once or twice a month some weary traveler, en route from Austin's Colony to San Antonio, might stop for food and lodging at the log cabin. So it was, late one Saturday afternoon, when Castleman heard a loud shout outside. Instinctively Castleman went to the window and could see a stranger waving both arms in a broad arc to attract attention. Upon reaching the palisade gate, Castleman learned that he was a French merchant named Gressier, seeking information about the route to San Antonio. Standing behind him was his small caravan of pack mules and three 2-wheeled carts, each of the later covered with canvas and driven by a Mexican teamster. Gressier had left New Orleans by steamboat two months earlier, and upon arrival at Natchitoches, Louisiana on the Red River, had purchased the carts and mules and had engaged the Mexicans, late of San Antonio, as drivers to guide his caravan of hardware and dry goods across Texas. The men and animals were quite weary from the long day's journey, and Gressier inquired where there might be a suitable watering-place and campsite for the night. Castleman directed the merchant to the small lake, some 300 yards distant toward the river, where there was plenty of water and grass for the mules, but he suggested that Gressier not camp for the night in the neighboring cedar brake. "Stranger, you and your teamsters kin camp here in my yard tonight behind the palisade," Castleman offered. "A Comanche war party has been reported up north of here, and you'd be in bad shape if they showed up down there at the lake. There's plenty of well water and wood here, and in case of attack we'd have a better chance to defend your property and mine." The Frenchman declined, however, remarking that they had not seen any Comanche signs along the trail. His Mexican hands were well armed and were experienced Indian fighters as well. And besides, he didn't wish to endanger his benefactor any more than necessary, for he knew that mules and horses attracted Comanches like buzzards to carrion. So Gressier and his teamsters drove the caravan down to the cedar brake where they parked the carts in a defensive perimeter, unharnessed the teams, watered and hobbled the mules, and allowed them to graze, after which they settled down for the night. Gressier's cargo, although not discernible to the casual eye, was only slightly less attractive to marauders than his mule teams. The packs were filled with axe heads, hammers, knives, hoes, scissors, needles, and just about every hardware item that a frontier merchant required. The carts carried casks of green coffee, kegs of whiskey, dozens of bolts of cheap cotton prints, calico, alpaca, and muslins, yarn and knitting needles, boxes of spooled thread of every hue, hogsheads of tobacco, and many other frontier necessities. As darkness approached, Castleman barred his shutters and doors, secured his household and livestock, and retired for the night. Dawn came amid a din of war whoops and musket fire. Even before the first rays of light punctured the horizon, a war party of Comanches were preparing to water their horses when they unwittingly stumbled into the Frenchman's campsite. The Mexican teamsters were not totally unprepared. At their sides lay an asortment of loaded muskets and pistols, and when the first sound of Comanche voices and pony hoofs disturbed their slumber, the Mexicans loosed a volley of shot which sent the warriors scurrying for cover. Before the war party could recover from its initial shock, Gressier and his men hurriedly overturned the carts in a triangle, stacked casks, packs, and bolts of cloth about as breastworks, and with all their muskets reloaded, they cautiously awaited the attack that was certain to come. Soon aware that they outnumbered their opponents by ten or more to one, the Comanches deliberately took their time before pressing their attack. They were heavily armed with bows, lances, and tomahawks, but carried only a limited quantity of muskets and powder. During the early hours of the fight, they encircled the Frenchman's camp at a distance of 100 to 150 yards away and employed various ruses to draw the Mexicans' fire. Gressier and his teamsters, in the hope of discouraging their attackers, triggered a volley of bullets at the first rustling of any branch or bush. Occasionally they caught momentary glimpses of the warriors as they darted about, and now and then, they knew a bullet had struck its mark when some Comanche howled or dropped to the ground. But throughout the fight, the war party did not show the least inclination to abandon the siege. At the first sound of gunfire, Castleman grabbed two muskets and rushed to a window. His cabin stood at the top of a hill, and he had an excellent view of the impending massacre, where columns of smoke and gun flashes emerged from the cedar brake surrounding the campsite. The number of ponies and glimpses of warriors scampering about confirmed his fear regarding the size of the Indian party. At a distance of 150 yards from the cabin was a gnarled post oak upon which Castleman had nailed a paper target for musket practice. The white object soon caught the eye of a young Indian. As he stood before it, curiously examining the bullet holes, Castleman took a careful aim and was about to pull the trigger when his wife intervened. She begged him to refrain from firing since, because of the number of warriors, the couple's only hope hinged upon the possibility that the Comanches might become intoxicated with their successful plunder of the caravan and leave the settler and his family unmolested. Soon aware that he was in an exposed position, the young Indian glanced quickly at Castleman's cabin and darted back into the underbrush. As the Indians had hoped, the constant rate of fire from the Mexicans began to subside and by mid-morning had deteriorated to only an occasional shot. Believing that Gressier and his teamsters had depleted their supply of powder and shot, the Indians, advancing from all four sides, crawled on their bellies to within fifty yards of the camp. At a given signal from their chief, they charged the teamsters, assailing them with a barrage of bullets, arrows, and lances. Gressier and his men fired one final volley, killing some of them, and then using their muskets as clubs, fought like tigers until a few screams and then a pervasive silence encompassed the massacre site. With the firing and yelling ended and his worst fears confirmed, Castleman and his wife fearfully pondered their perilous predicament. He even thought of dispatching his wife and son on horseback in the direction of Gonzales, but decided against it. In time the Indians' upraised voices, whoops, and laughter became increasing loud. They ramsacked the carts and packs, broke open the whiskey kegs, and soon were dancing about an open space, their bodies wrapped with bolts of brightly-colored cloth. Later Castleman watched as two columns of mounted Comanches filed slowly over the neighboring hill. Some of them held a bolt of cloth under each arm, while others struggled to carry a cask or a keg. Then there followed in single file near the end of the column six of Gressier's mules, their packs in place. As the last Indian disappeared over the horizon, Castleman counted altogether almost eighty horsemen, the largest war party of Comanches he had ever seen or heard of in Dewitt's Colony. At the end of the columns rode the young Indian, no more than a lad and probably on his first raid, that Castleman had had in his gun sights. Already nearing the point of drunkenness, the boy carried a box under his arm and toyed with a single spool of red thread, the end of which had been wrapped around a finger, in his right hand. The spool soon fell to the ground and, as yard after yard trailed out behind him, the youth became fascinated by the great length of thread that was wound upon the reel. As each spool played out, he starting reeling out another spool of yarn, and then another, and by nightfall, after the Comanches had ridden westward for hours along the river, there was mile after mile of colored thread stretching along the south bank of the Guadalupe River. When the last Indian disappeared, Castleman took his musket and headed for the lake. The battle site was fully as ghastly as he had expected -- mutilated corpses still bleeding from multiple lance wounds. He also found several Indian bodies floating in the lake. 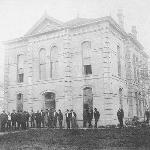 Castleman hurriedly gathered his family and some belongings and carried them to safety in Gonzales, arriving late in the night. News of an Indian attack traveled fast and far in the Gonzales vicinity, as it always did. Before noon, Castleman and twenty-seven other men were in the saddle and en route back to the battle scene on the Guadalupe. The group of frontiersmen with Castlemen included Mathew Caldwell, John Davis, Robert M. White, Dan McCoy, Jesse McCoy, B. D. McClure, Ezekiel Williams, George W. Cottle, Andrew Sowell, Sr., Dr. James Miller, Almeron Dickinson, Jacob C. Darst, and several others, some of whom had arrived from the States only two days earlier. McClure was elected to lead the men, and shortly after noon, they arrived at the scene of the massacre. The Indian trail was plain and clear, sometimes red, sometimes green, or blue, but always it followed west along the south bank of the river. At about the spot where the trail of thread played out, the war party crossed the Guadalupe at Erskine's Ford, later following. Days passed before McClure and his men finally sighted the Comanche campfire on a high ridge overlooking the San Marcos River, opposite the present-day city of that name. In the center of their camp, the warriors had erected a pole, around which the grass had been completely trampled down, for throughout the previous night, the Comanches had performed their well-known scalp dance, celebrating their victory. Outnumbered as they were by three to one or more, McClure and his men were unwilling to risk a fight without the element of surprise, and as the Indians were then in the process of breaking camp, the Gonzales frontiersmen chose to pursue them along the banks of the Blanco River. Two more days would elapse before the company would encounter the Comanches again. They followed them along the banks of the Blanco, where fresh Indian signs confirmed that the war party was only a short distance ahead. Obscured the following morning by a dense fog bank, McClure and his men were moving cautiously along the south bank when suddenly the fog lifted, and an Indian lookout on a nearby hillside sounded an alarm. Thus discovered and cheated of the element of surprise, McClure hurried his company to a thick cedar brake, dismounted, and sent Darst and Dickinson ahead to scout for the main body of warriors. The rest of the men advanced through the thick underbrush and were almost to an open field by the river when they saw their scouts beating a hasty retreat, closely pursued by eight Comanches. The two scouts led their happy pursuers right into the musket muzzles of their companions, who promptly dropped the eight Indians with as many shots. Other whoops and shouts revealed that the main body of Comanches was straight ahead near the river bank, and McClure's men charged across the open field to the next cedar brake. When they finally made contact, it became obvious that the war party was seeking to escape across the river with their plunder rather than press the fight, and their yelling and whooping almost drowned out the ensuing musket fire. A few warriors attempted to put up a limited, rear guard defense, releasing volleys of arrows, while others led loaded mules into the water, or started wading across the river carrying bolts of cloth. Their meager defense soon gave way to total rout, however, the fleeing warriors abandoning much booty on the south bank in their haste to escape to the underbrush on the opposite shore. Spread out as they were along the Blanco, the Indians' flight actually became a trapshoot for the frontiersmen, who fired as fast as they could reload. The general melee of battle lasted perhaps ten or twelve minutes, with nearly half of the war party escaping to the opposite bank where they soon disappeared, and the remainder dying or drowning in the middle of the stream and bolts of cloth floating downriver. Thus shorn of their mounts and weapons, those who escaped were no longer effective as a raiding party, and no further attempt at pursuit was made. The Texans had lost none of the frontiersmen killed, although three of them had been hit by arrows, each suffering a minor flesh wound. McClure's men then collected the stolen mules and Indian ponies, loaded as much of the Indian plunder as could be salvaged on the animals' backs, and began their long trek back to Gonzales. The fight on the Blanco River was only one of many such engagements that would transpire before the hostile Comanche tribe would eventually be subdued and resettled in Oklahoma. And certainly many more lives and scalps would be lost before that day would arrive. One of McClure's veterans, later to become Captain Mathew Caldwell, or "Old Paint," of the Texas Army, eventually led a dozen or more expeditions to curb their depredations. In 1842, Caldwell became the hero of the Battle of Salado Creek, but many of McClure's old Indian fighters were no longer living to be with their comrade that day. On March 6, 1836, the day that the Alamo fell, Jake Darst, Jesse McCoy, G. W. Cottle, Robert M. White, Almeron Dickinson, and a couple of others were among the twenty-one Texans from Gonzales who died with William Barret Travis, David Crockett and James Bowie in defense of Texas' most sacred shrine. Reprinted from "Killer's Trail of Thread," TRUE WEST, June, 1978, pp. 18ff. Related Topics: Texas | Features | Columns | "Cannonball's Tales"